When you start any of the products of the SimmLine family for the first time, you will be asked to enter the product activation key. 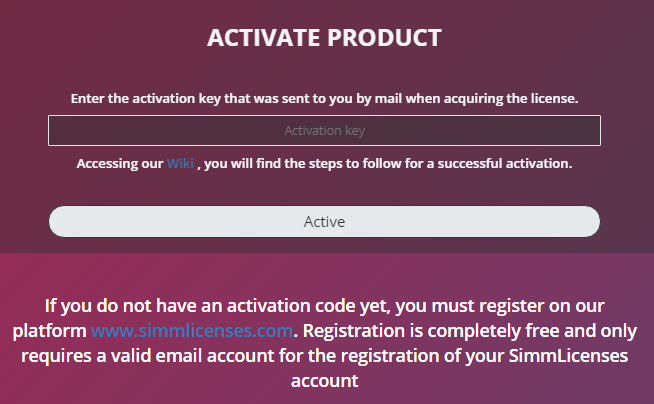 At the moment of activating the system you do not have an Activation Code, it is necessary that you register on our platform www.simmlicenses.com. You can consult the guide SimmLicenses First steps, to make the most of the tool. The activation process is very simple and intuitive, it is only necessary to enter the key obtained when activating the Trial or when Acquiring the license and clicking on the Activate button. 1 – It originates when an invalid key is entered or it does not correspond to the same product. Verify in the body of the email that you received when acquiring the license, to which product the license corresponds and that it coincides with the one you are entering in the Activation Key field, the field is case sensitive. If the data you are entering is correct and the problem persists contact us in the box support@simmline.com. 3 – This error can occur if the product was installed in a Linux distribution other than those currently approved by SimmLine for its products. See the technical requirements section in the Installation Manual of each product, in our WIKI.